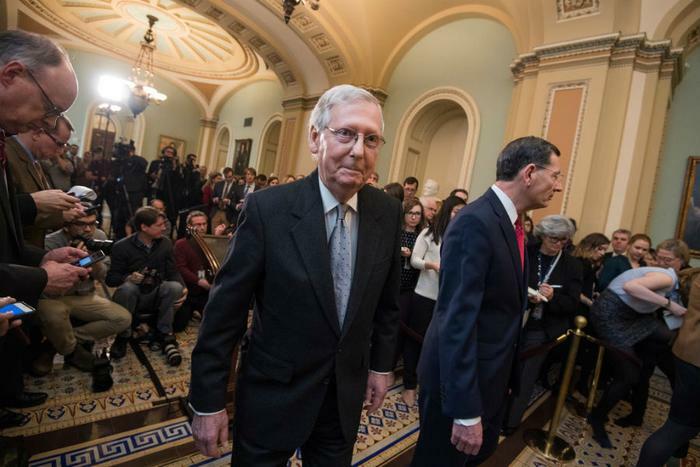 Whether he knows it or not, U.S. Senate Majority leader Mitch McConnell (R-KY) is fighting to legalize a cannabis crop that bears a striking physical resemblance to marijuana. In a joint announcement with Kentucky's Republican Commissioner of Agriculture Ryan Quarles, McConnell said he wants his home of Kentucky to become a leader in hemp cultivation. The senator and Quarles said in a news release on Monday that they plan to introduce the Hemp Farming Act of 2018, which would remove hemp from the list of illegal controlled substances where its been for decades. Federal drug laws have long banned the cultivation of hemp, a cannabis crop that looks like marijuana but does not have enough THC to create a high. But advocates and farmers note that it has thousands of potential uses. Much of the agriculture industry has already been lobbying to declassify hemp as a Schedule I controlled substance. The Farm Bureau, National Association of State Departments of Agriculture, National Farmers Union, and the National Conference of State Legislatures have all argued in recent years that lawmakers need to remove hemp from the same list that has relegated marijuana to an illegal controlled substance under federal drug laws. “To negate any talk that this is a left-leaning fringe issue, 14 current and former GOP governors have enacted hemp legislation under their watch – including Vice President Mike Pence,” writes Jim Holte, the former president of the Wisconsin Farm Bureau Federation, in an editorial calling for the decriminalization of hemp. Over 30 states, including Indiana during Mike Pence’s reign as governor, have passed laws to pilot hemp cultivation in response to an Obama-era measure that defined hemp as a crop distinct from marijuana. Indiana has yet to produce hemp, however, as their pilot program depended on clearance from the feds, which has not yet been given. The 2014 Farm Bill for the first time in decades said that states are free to regulate the cultivation of hemp -- but the provision came with several caveats. Hemp could only be grown “for agricultural research purposes where permitted under state law,” according to the Obama-era farm bill. Over 30 states since then have launched pilot programs to grow hemp with some sort of research component, though the state laws vary in strictness because of conflicting interpretations of the federal farm bill. Some state lawmakers, for instance, have already allowed farmers to begin growing hemp and are speaking optimistically about the revenue they hope the crop will generate. Others, however, are limiting hemp cultivation to strictly research purposes or waiting on additional federal legislation before they implement their programs. As it turns out, McConnell’s home state of Kentucky has taken one of the more liberal interpretations of Obama’s farm bill. Kentucky’s industrial hemp program has been well underway and the state recently permitted its first CBD oil facility -- which is technically in violation of federal drug laws. People who find medical benefits from using marijuana but who do not want to experience a high often turn to cannabidiols (CBDs), a product derived from hemp that does not create a high. Anecdotal evidence suggests that consuming CBDs in oil form (such as via a pill or a candy) may benefit people suffering from certain medical conditions, such as epilepsy or depression. However, federal drug laws in the United States currently do not allow researchers to study its potential uses. The DEA has maintained that CBDs are illegal, even in light of the 2014 Farm BIll. The agency in 2017 issued a statement to the site The Cannabist alerting consumers that it still considered CBD oil to be a Federal I controlled substance that cannot legally be produced in the United States. “At present, this material is being illegally produced and marketed in the United States in violation of two federal laws,” the agency said..
As with marijuana, many states have defied those federal laws, and some vendors have been in the crosshairs of local police agencies specifically for selling CBD oil. Legal weed dispensaries in Alaska and stores in Tennessee have both been raided by law enforcement agencies for selling CBD oil -- to the confusion of patients and advocates who contend that the product doesn't even make users high. Despite the DEA’s stance on CBD oil, numerous states have decided to allow hemp farmers to extract it from their crops, including Kentucky. Under Kentucky’s popular hemp pilot program, the state department of agriculture last year announced plans to build the first CBD oil processing plant in the United States, which they also claimed will be the world’s largest. The Kentucky Department of Agriculture issued permits in December to Kings Royal Biotech of Kentucky to produce “pharmaceutical grade” CBD. The firm is partnering with Chinese investors, and the $30 million facility broke ground several weeks ago. In his announcement of the Industrial Hemp Farming Act of 2018, McConnell pointed to Kentucky as a model for the rest of the country. “The Hemp Farming Act of 2018 will help Kentucky enhance its position as the leading state on hemp production,” McConnell said in his announcement, which did not mention CBD oil specifically. A message left with McConnell’s office have not yet been returned to ConsumerAffairs.